Coach's Corner - Vincent Van Gogh hand painted/certified original artwork. Go Back to Lot List Vincent Van Gogh hand painted/certified original artwork. 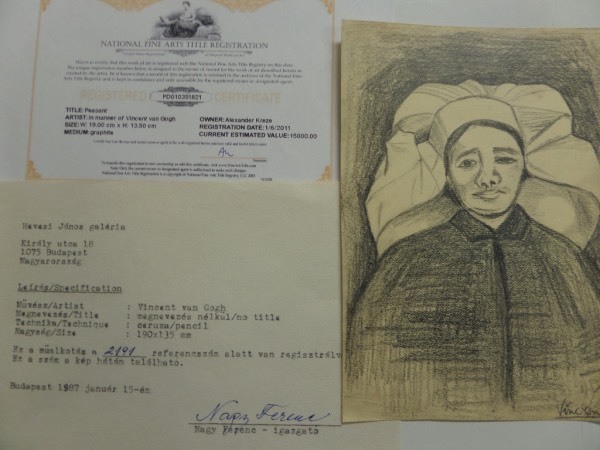 This $15,000 appraised work is a rare one of a kind, and comes hand signed simply "Vincent" by the master. It has more authenticity than you can shake a stick at, National Fine Arts, original owner, a Budapest Gallery from 1987 etc. It is a 5x7 graphite on paper work, shows a "Peasant", and belongs in every serious art collection. We get these occasionally, and never get a return! Solid buy and hold investment, and with a ridiculously low asking price as well.